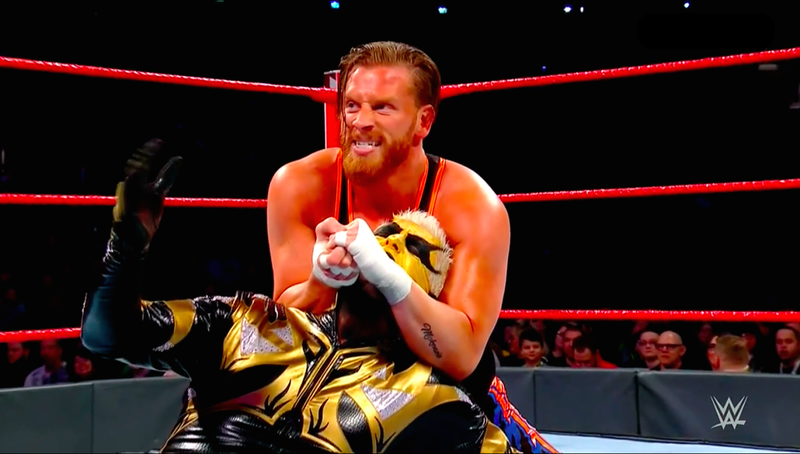 The Big Takeaway: Curt Hawkins’ losing streak continued with a loss against Goldust, who was managed by Mandy Rose. Kalisto defeated Ariya Daivari in a longer than usual cruiserweight offering that left Daivari without a win since August. Hawkins' never-ending losing streak continued here with another loss to Goldust, whose partnership with Mandy Rose has given him a new lease of life. After a lot of comedy early on, Hawkins took control when he waffled Goldust on the apron to send him outside. He followed him and nailed him with a stiff clothesline and they teased a count out finish. Goldust rolled back into the ring at 9.75. Hawkins took over the match, slowing things down with a rear chinlock until Goldust got some separation with a spinebuster. He got the heat with clotheslines, a running bulldog, and a scoop slam. Hawkins wriggled out of the first attempt, but Goldust kicked him in the gut and hit the Final Cut for the win. The loss took Hawkins to 0-171 but was a good win for Goldust in preparation for his Mixed Match Challenge bout with Mandy Rose against Jimmy Uso & Naomi on Tuesday night. Speaking of losing streaks, Daivari currently finds himself on one of his own. Without a win since August in all competitions, the loss here to Kalisto took him to 0-28. Daivari disrespected Kalisto early on but soon looked the fool. After mocking Kalisto’s "lucha" chant and even laying across the top turnbuckle, Kalisto hit him with a kick to the side of the head and then shot at him with a suicide dive outside. After the break, the pace had slowed with Daivari using his heel moveset to keep Kalisto from using his speed and agility. This led to a near fall when Daivari absolutely nailed Kalisto with a spinebuster, but Kalisto just managed to get his shoulder up. Daivari tried to pull off Kalisto’s mask, but it didn’t lead anywhere. Having put up a good fight and putting on a decent match, Kalisto finished Daivari off by planting him with a rana and the Salida del Sol for the win.